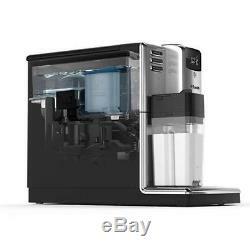 Philips HD8917 / 01 automatic Cappuccino Espresso coffee maker steel black. 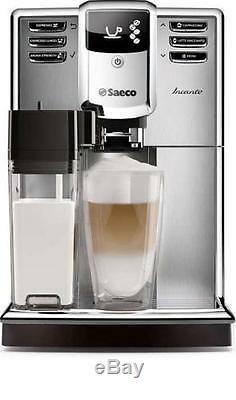 Delicious Latte Macchiato at the touch of a button. The Saeco Incanto sets a new standard in its class. The refined, stainless steel front houses high-quality Italian technology, engineered to brew divine coffee, every time. Your coffee dreams have finally been answered. Any coffee for any moment. Enjoy 6 beverages at your fingertips. One-touch Cappuccino and Latte Macchiato with milk carafe. Adjust the length, 5 aroma strength and 5 grinder settings. Adjust and store your personal user profile. Every coffee crafted to perfection. 100% Ceramic grinders for long lasting performance. Perfect milk foam thanks to Latte Perfetto technology. Iconic stainless steel finishing, shaped to precision. Hot coffee from the first cup with the quick heat boiler. Attentive and anticipating at your command. Featuring AquaClean for up to 5000 cups without descaling. Clean milk residues after every use with milk clean function. Designed to maximize capacities in a compact footprint. Enjoy a great coffee with Auto-Rinse & guided descaling. Ceramic material ensures long-lasting performance and silent operation while not deteriorating. This means you coffee will be always ground like the first time, delivering the best of your beans for more than 15.000 cups. Enjoy a wide variety of drinks to suit any occasion. Whether you crave for an espresso, a cofffee or a milk based recipe, your Superautomatic machine delivers a perfect in-cup result with no hassle and in no time! AquaClean is our patented water filter, designed to improve the quality of your coffee by purifying water. It also prevents scale buildup in the water circuit of your coffee machine: make up to 5000 cups without descaling by replacing the filter regularly. 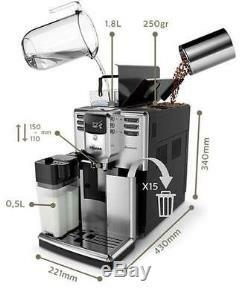 This espresso machine automatically cleans its coffee circuit with water upon starting up or switching off of the machine, this delivers a great, fresh taste with each cup of coffee. Regular descaling prolongs your espresso machines life. This machine will prompt when descaling is needed. It will guide you with on-screen messages what you have ton do and when. This Super-Automatic machine offers an abundance of indulgent options to customize your beverage to your taste. You can easily personalize and memorize length, strength and temperature for each drink. Feel free to explore, experiment and dream up any drink! High capacity & compact design. Enjoy more room and go longer without refill thanks to the high-capacity bean, water, and waste containers in a super-compact design. This smart, super-automatic machine provides you with maximum convenience and top notch performance thanks to a large capacity water tank, bean and waste container. 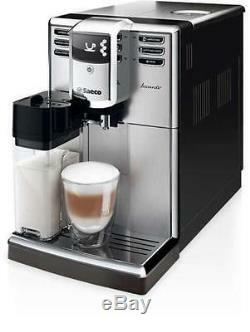 Enjoy super creamy cappuccino and Latte Macchiato at the perfect temperature, in the easiest way possible. Simply pour milk into the carafe, plug it into the machine, and select your preferred beverage. Whether it's a cappuccino or frothed milk, your drink will be served within seconds, with a splash-free flow at the ideal temperature. Every coffee you prepare will be topped with a silky, milk layer that beckons the taste buds. The milk carafe froths the milk twice, then pours a splash free creamy layer into your cup at just the right temperature. The carafe can also be stored conveniently in the fridge and it is incredibly hygienic. Milk Solution: Integrated Milk Carafe. Type of carafe: Basic carafe. Capacity milk carafe: 0.5 L. Capacity waste container: 15 servings. Capacity water tank: 1.8 L.
Coffee bean capacity: 250 g. Color & Finishing: Stainless Steel. Product dimensions: 221 x 340 x 430 mm. Water tank: Access from the top. Weight of product: 7.2 kg. Coffee and Milk Length: Adjustable. Pre Brew Aroma control: No. Main Switch ON / OFF button. Beverages: Cappuccino, Espresso, Espresso Lungo. Hot water, Latte Macchiato, Milk froth. Some items might come with a default language in German you will have to go in the menu and select the language you need or change on start-up. Electric items come with 2 round pin Europe style plugs, we will include an adapter depending on the destination country. Counties with strict custom rules and regulations like: Russia, Vietnam, Ukraine, Kazakhstan, Brazil, Chile, Uruguay, Israel, etc, may take longer due to strict custom rules and regulations, not couriers delay. We cannot control on know about this delay in advance. Please have a look at our. The item "Philips HD8917 / 01 automatic Cappuccino Espresso coffee maker steel black" is in sale since Sunday, July 16, 2017.